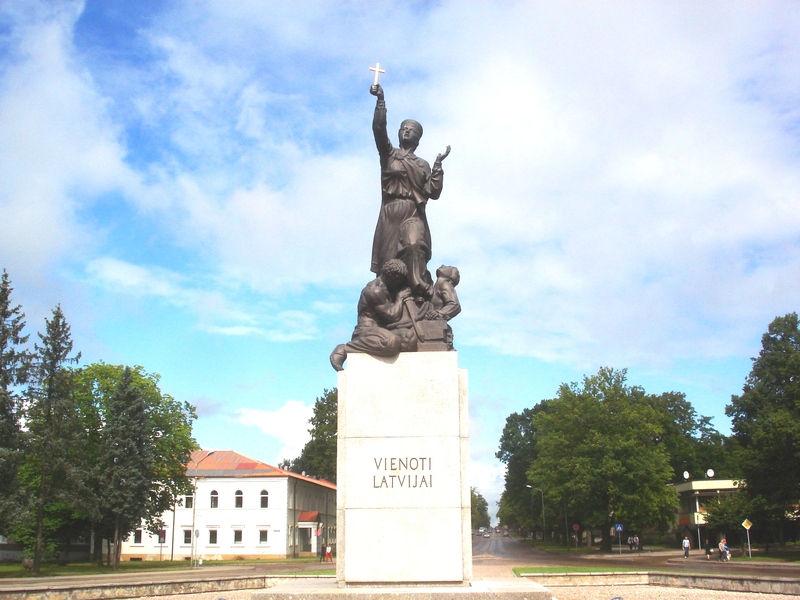 In the centre of Rēzekne, bordered on either side by a main road, there is a striking monument. It shows a woman in an uncomfortable-looking traditional headdress rising above a couple of fallen soldiers, thrusting a cross aloft, her gaze fixed on the heavens. Below her are the words “Vienoti Latvijai” (For a United Latvia). Popularly known as Māra of Latgale, it commemorates the decision of the region of Latgale to join the nascent state of Latvia shortly after the end of World War I, and is now in its third incarnation, the previous two having fallen foul of the Soviets. Rēzekne is the second-largest city in Latgale, a region bordering Russia and Belarus which is the country’s most ethnically complex. Last Wednesday, in a televised thought experiment shown by the BBC, “World War Three: Inside the War Room”, Latgale was portrayed as a potential trigger for war between Russia and NATO. The hour-long “war game” took as its starting point unrest among Tallinn’s Russian-speaking population, followed by Latgale’s largest city, Daugavpils, then the rest of the province being taken by pro-Kremlin separatists, and then with alarming speed to Armageddon. Rēzekne, which promotes itself as “the city in the heart of Latgale” certainly does not feel like a city likely to descend into violence particularly soon. It is much more of a microcosm of Latgale – a region where no ethnic group forms a majority – than heavily ethnic Daugavpils, with Russians and Latvians (most of whom are native speakers of Latgalian) both making up roughly 45 per cent of the population. Jānis Elksnis, a native speaker of Latgalian who runs a Rēzekne publishers dedicated to printing books in the language, tells me that people live together in peace in the city. Arriving at the flat where I am staying for a few days, I ask the Russian landlady to recommend somewhere to eat, and in accented but excellent Latvian she directs me to her favourite bar, a cosy spot decorated with Latvian flags where the menus are printed in Latgalian. “Inside the War Room” is not a good programme, and not a good reflection of reality in Latgale, although it is guilty more of sins of omission than of factual errors – although there certainly are those as well. Perhaps the most striking was the impression it created that Latgalians are a separate ethnic group, after autonomy from Riga and prepared to cooperate with Russia if needs be. All we learn about them is from one member of an angry crowd in Daugavpils who says that Latgalians and Russians are discriminated against, “are nothing” in Latvia. The fiery pro-Kremlin mayor of the city also classes Latgalians and Russians together against Latvians and orders Riga to stop “bullying” the region; his tooled-up henchmen wear blue, red and white patches bearing a griffin, an ancient symbol of Latgale. Greater autonomy for the region is one of the concessions propose as a way to try to negotiate with Putin. This is not an accurate picture: I have spent a lot of time in Latvia and have never met a Latgalian who did not also identify as Latvian. Vairis, a Rēzekne native, agrees: “I feel Latgalian, and Latgalians, in turn, as a rule feel Latvian, not in the least bit Russian. The only kind of people who believe that ethnic Latgalians would favour being part of the Russian Federation are those who either never bothered to speak with any ethnic Latgalians, or who are unable to distinguish Latgalians from Baltic Russians”. Although Latgalians have their own language (sometimes considered a dialect of Latvian, as it is mostly mutually intelligible), flag, traditions and are mostly Catholic in a largely Lutheran country, there have been no discernible separatist urges. To put it in terms the BBC producers will understand, their relation to Riga is equivalent to that of Scousers or Geordies (inhabitants of Liverpool and Newcastle) to London, not of the Scots or Welsh. Further problems of omission relate to the situation of the Russian minority in the Baltics. The total information we receive about this is from Putin – describing Estonia’s treatment of its Russians as “disgraceful” – and the same angry woman in the Daugavpils crowd, who complains that she cannot even vote in the country where she lives. Are uninformed viewers likely to conclude that Russians are barred from voting in Latvia? Quite possibly. This is aside from logistical doubts, such as the suspicious speed and smoothness with which these ragged band of separatists managed to extend their control to “a sizeable stretch” of the Russian border, around 100 miles from Daugavpils, the other side of a number of majority-Latvian towns. Even assuming (as those in the war room do) covert military assistance from Russia, it does not seem plausible that there wouldn’t be at least some resistance in a country with a sizeable volunteer paramilitary home guard and with traumatic memories of 1939, when it acceded to the placement of Soviet forces on its territory without a fight. A number of people vaguely familiar with the Baltics have asked me why the programme-makers chose Latgale rather than elsewhere. Certainly, Estonia’s border city of Narva, where over 90 per cent of the population are Russian speakers, would seem more promising both geographically and demographically. After the scenes in Tallinn (using real footage from the 2008 Bronze Soldier riots, the only incident of serious ethnically-based violence in the Baltics since the restoration of their independence), we are simply told that unrest spreads to Latgale. It is strange to imagine that there would be a stronger reaction here than in Narva or Riga, both of which have much closer links to Tallinn than Daugavpils does. It could be based on an awareness than Latvia’s army is less well-funded and less prepared for conflict than Estonia’s, but I suspect it is simply based on a lack of research into the realities of the region. A small but significant mistake is the reference to Latvia’s fictional defence minister, played by a man with a distinctly Slavic accent, as being called something like “Erik Jurtz” (the spelling is never made clear). This is not even a grammatically possible name for a Latvian to have: all male names, almost without exception, end in the letter “s” for first name and surname. A small quibble, perhaps, but it is the kind of detail that any Latvian or anyone who has spent a reasonable amount of time in the country would pick up immediately; this, combined with other errors, rather gives the impression that no Latvians were consulted for the script. All that seems to have been done is to transpose the most dramatic aspects of the Ukraine crisis onto a very different country. This is in keeping with the dismissive tone taken by many of the British participants of the war room (acting, of course, but apparently demonstrating roughly their real positions) towards Latvia: intelligence is described as “neither very competent nor very impartial”; Liberal Democrat foreign affairs spokesperson Kishwer Falkner seems to argue that Latvia’s small population – equivalent, she observes, to just a handful of British metropolitan boroughs – means it is not worth confronting Russia over. Parts of the programme’s thesis are undeniable. Latgale certainly does have serious problems – it is by some distance the poorest part of Latvia and one of the most impoverished parts of the EU. Deindustrialisation and emigration have affected it even more seriously than other areas of the country. The real-life equivalent of the fictional pro-Russian mayor of Daugavpils is called Jānis Lāčplēsis – a name, incidentally, that is almost comically Latvian, Jānis being by far the country’s most common male first name, and Lāčplēsis the name of its national hero. In an interview with Latvian website Skaties, he said – rather wearily, I suspect – that every time journalists and politicians visit looking for separatists and “little green men” he tells them that the real threats are schools closing because of a lack of pupils, high unemployment, low salaries and pensions. Hopefully if nothing else, the increased focus on the region will lead to serious consideration of how best to address these problems. But this does not change the fact that there has been no recent evidence at all of separatist activity in Latgale, bar rumours spread by dubious think tanks and one very overhyped manipulated map. It is impossible to compare this to the situation in places like Kharkiv, Odesa or even Chișinău. In an excellent article for Latvian Public Broadcasting, Mike Collier points out that by portraying violence, including particularly symbolically emotive scenes – crowds burning the Latvian flag, the misuse of real cultural symbols like the Latgalian emblem – among a real population who have shown no sign of doing any such thing, “you are running into dangerous territory and probably stretching your narrative too far.” If the last few years have proved anything, it is how easily media can be misused and targeted at those unable or uninterested in accessing reliable information; what the BBC has just given to those unscrupulous people is professionally filmed, convincingly realistic scenes of angry Russian-speaking crowds railing against the oppression of Riga. So if it is so improbable, surely it does not matter that it was shown? It is just a piece of entertainment and has no real consequences. Well, no, I do not believe so. While this particular situation is highly unlikely, in my view, the prospect of Putin taking aggressive action in some form in one or all of the Baltic states in the next couple of years is far less unthinkable. The response of NATO members then will most likely decide whether the alliance can remain a realistic deterrent to Russian aggression in Eastern Europe. Public and media opinion matters a lot, and what this programme has demonstrated is that the level of knowledge about the Baltic states among the public, and even among much of the political and military elite, is very low. This “War Room ” is not entertainment.The creators are misinforming a naive audience and perhaps creating a dangerous attitude in the E U .